Apple cider is a traditional drink enjoyed during the fall. Hot apple cider can be infused with other fruit flavors, including cranberry juice and orange zest to make a flavorful beverage. Include warming spices such as allspice, cinnamon and nutmeg. Or, serve it spiked with a shot of bourbon or rum for a festive seasonal warmup. Baked apples are a delicious family favorite. Use a melon baller to carve out the core then cut shallow slits around the sides of each apple to avoid too much splitting. Place apples in a baking dish, and fill them with a mixture of brown sugar, butter, chopped walnuts and cinnamon. Pour apple or orange juice into the baking dish. Then bake at 350°F for about 35 minutes or until the apples are just tender. 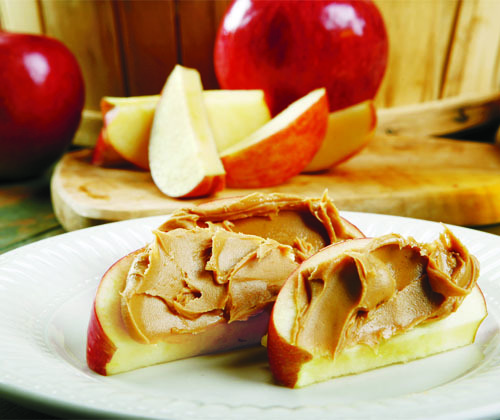 Apples add a crisp texture and sweet flavor to a variety of sandwiches and salads. Dice into smaller pieces before tossing into a salad. Apples typically complement lighter vinaigrettes and salads with feta or blue cheese. Sliced apples make a great addition to a cheese and nut board, or simply served as a snack with peanut butter for dipping.